In October 2002, I was asked to write about life in the 1980s Philadelphia punk scene in a retrospective for Philadelphia City Paper. Writing as Frank Blank – my musical alias adapted from Brian Eno’s “Blank Frank” - I had covered that musically-chaotic time frame for this weekly newspaper for nearly the entire decade. It was all Mick Jones’ fault. The Clash were playing the Walnut Street Theater in September 1979. At the time I thought -- still do think, actually -- they were about the coolest band around, so I moseyed on down to the Benjamin Franklin Hotel at Ninth and Chestnut to see what I could see. What I saw was The Clash, happily sitting around in the lobby and chatting with their fans. After getting my Give ’Em Enough Rope poster signed by all four band members, guitarist Jones and I had a wide-ranging conversation about rock. The topic of playing guitar came up, and I mentioned I’d always wanted to play, but since seeing Jimi Hendrix when I was 13 I had only watched with longing. "Why don't you, then?" Jones asked. "I'm no better than you are." A Beavis-like light bulb began buzzing in static over my head as the idea sank in. Hmm... Why don't I? 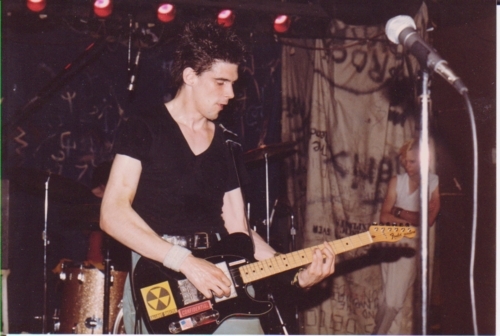 The punk ethos in action! Attempting fierce Strummer Scowl with Informed Sources. Mohawk chick in background not impressed. Shamelessly copying Joe Strummer, I armed myself with a black Fender Telecaster from Eighth Street Music and set about establishing "A Big Career in Rock Music." 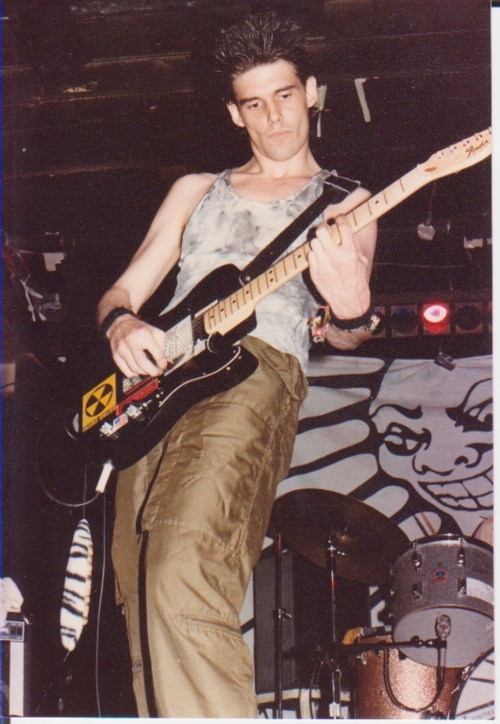 Flash-forward several months, and we find my newly formed band, Informed Sources, on stage at the Elk's Center on 15th Street at the first Philadelphia Punk Rock Festival. It was also our first gig. 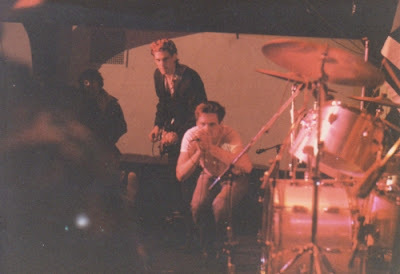 In front of hundreds of frantic, nascent Philadelphia punks we launched into our big opener, "Change." Such a glorious noise we made -- until approximately 13 seconds later, when all those nice loud guitar sounds came to a startling halt. It turned out that the guitar cable, though appearing fully inserted, had worked its way just shy of completing the circuit into the amplifier. A problem easily fixed once found -- but in that 90 seconds or so I learned a new aspect of terror. But survive I did, and -- along with Sadistic Exploits, Decontrol and Autistic Behavior -- Informed Sources began building the foundation of Philadelphia's contribution to the quickly evolving realm of punk rock. Bearing down on the downstroke. Informed Sources, East Side Club, Philadelphia. 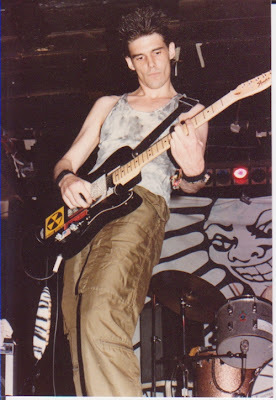 Before playing I'd already been involved in the city's music scene, first as a member of the fan-organized booking concern The Swingerz, led by David Wildmann, and then running Omni's at Ninth and Walnut with Denise Herman and WXPN's Lee Paris, a figure worthy of his own book. In Omni's confines we presented bands ranging from Bauhaus to Dead Kennedys - until the club burned to the ground under mysterious circumstances. I still have a good number of albums with water-damaged covers, rescued from the rubble after Lee, our pal John Koo and I begged a cop to let us into the ruins to salvage what we could. The later Informed Sources lineup: Drummer Sky Kishlo (who joined after Doug Mosko departed), singer Joe Stack, bassist David Gehman, and your blog host. 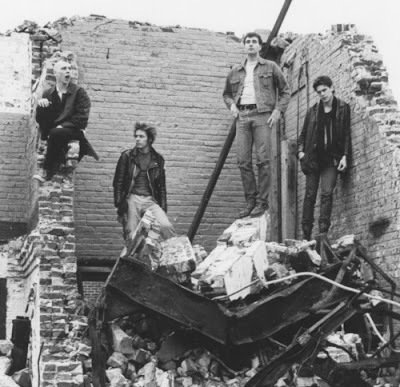 As soon as Philadelphia's old Abbotts Dairy factory at 2nd and South Streets met the wrecking ball, every punk band within 100 miles turned up for promo photo shots. Informed Sources played throughout the region in the early 1980s, with X, Black Flag, Dead Kennedys, Flipper, The Replacements, Hüsker Dü, Bad Brains and countless more. It was a thrilling time, sharing stages with bands that I was excited just to see live. And my apartment became an ad hoc motel. Jello Biafra camped under the stairwell one night, John Doe and Exene Cervenka of X another. That was probably the last era in rock history where you could read a feature about a band in Rolling Stone and find one of the members emerging from your bathroom the next morning. Provide lodging, get the opening slot on the bill. 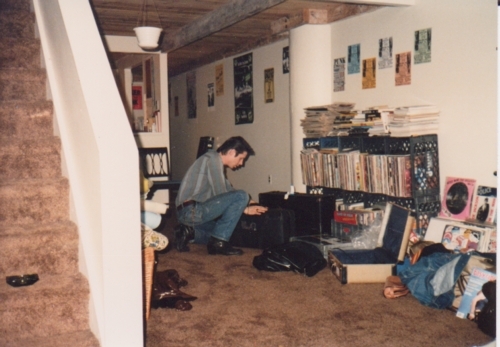 A touring John Doe of X settles into the Blank estate in Riverloft Apartments, Philadelphia. When Informed Sources ground to a halt, I was invited to join my favorite band in Philadelphia, Bunnydrums. It gave the exploratory group a three-guitar lineup, with all three guitarists having totally different styles. It was a prescription for chaos, but somehow it worked, and some of the best shows I was fortunate enough to play with them still rank among the most powerful performances I've ever heard, regardless of my own participation. During the Bunnydrums era, City Paper's Michael McGettigan approached me about writing a biweekly column for the newspaper. I hadn't written about rock since I was a teenager interrogating Robin Trower and Jethro Tull, but there were so many good bands that weren't getting any press at the time that it seemed like a good idea. I quickly found out how many good bands there were who not only weren't getting any press but who would get really pissed off if you didn't show up at their gigs. I also found out how easy it is to make enemies when your words get printed, and how hard it can be to find something to say about some truly awful music created as a result of someone's best efforts. I'm sure a lot of that still applies to all the poor souls trying to convert their love of music into words today. But in my eyes, the one thing that really differs in the Philadelphia scene of the late '70s and '80s versus today is the physical environments where the music is presented. Though the turgid confines of The Hot Club had character to spare, I loved seeing bands in bigger spaces. There was the narrow-but-long expanse of Filly's on Chestnut Street, the multi-floor Rainbows/Kennel Club near 12th and Walnut, the subterranean big room of the East Side Club at 13th and Chestnut, the spacious Ripley Music Hall at Sixth and South, the balcony-equipped Love Club near Broad and South, and across the Delaware River, the former Latin Casino had undergone an astonishing metamorphosis into the cavernous “new wave” playground Emerald City. Though Philadelphia now has a handful of influential small clubs, the bigger spaces with character to match have fallen by the wayside in a city often more obsessed with dance club culture than rocking out. But during a brief-but-glorious era those long-gone clubs hosted bands like Public Image Ltd., The Pretenders, Simple Minds, Wall of Voodoo, U2, The Ramones -- and they were big enough to hold the crowds that followed those groups while giving local bands some high-profile opening slots. Ah yes, musical time has marched on, and not always for the better. But as bracing as a nice blast of modern Pantera or Meshuggah's math-metal can be, it is fun to dig back into one's roots. In fact, I still plan to remaster and release the works of Informed Sources on CD. There's just one problem: the studio multitrack master tapes manufactured by Ampex at the time have a flaw that necessitates baking them in an oven before they're copied, lest they fall completely apart. Was that era really so long ago that time already demands preservative procedures? Horrors! 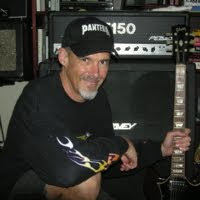 Frank Moriarty is the author of Sonic Kaleidoscope: The Creative Chaos of 1970s Rock, with a foreword by Brian May of Queen, published by Cooper Square Press in fall 2003. Frank: Just testing to see if I can leave a comment. Cheers Frank great read hope your going to make it this weekend! Great well written post Frank, saw many of those shows and sad to see that I missed others. Thanks for the interest folks, and sorry that the Comments were a "technical difficulty" at first. Thanks also to Dennis for his work to keep the Philly scene alive!